1.Take a 12x12 sheet of Dovecraft Floral Muse paper and tear around the edges. 2.Along the right hand side of your sheet, tear off a section in the middle. Pick a Floral Muse doily and cut a quarter of it. Glue this behind the sheet. 3.To create the laced up detail as seen on the top left corner, punch 5 sets of holes starting from 1cm apart, increasing the gap between the holes until you reach the top of your sheet. Cut a length of Floral Muse lace and thread it through the holes as if you were lacing up a pair of shoes. Tie the two ends together at the top of your sheet. 4.Take a coordinating sheet of 12x12 Floral Muse paper and cut it down to 13cmx25cm. With the Fiskars Border punch, punch along the bottom edge. Choose a different design from the 8x8 Floral Muse pack and cut it down to 8cmx17cm. Again, use the Fiskars Border punch along the left edge. Carefully punch a line of holes on each sheet using a paper piercer. Connect the two sheets by stitching vertically to the right of your border. To add more stitching to your scrapbook, you can also do a vertical line of stitching along the right edge, to secure your doily behind your sheet. TIP: If using a sewing machine there’s no need to pre pierce the holes, the needles will easily blunt in the paper so save your old needles for use on paper. 5.Cut a sheet of 8x8 Floral Muse down to 20cmx12cm , and tear along the edges to gain a rustic effect. Layer this on top of your stitched sheets, 4cm in from the left hand side. 6.Take a green doily from the Floral Muse collection and layer this on top to the left of your layered sheets. 7.Use the border die from the Belle and Boo collection and die cut it twice on a sheet of 8x8 Floral Muse paper. Cut out the two borders and trim them down to 6cm. Adhere one border to the bottom right of your layered sheets and the other below the bottom edge, vertically. 8.Cut a 24.5 cm length of Floral Muse lace and glue this to the bottom of your layered sheets. Adhere your layered sheets to the centre of your layout. 9.Glue your layout onto a coordinating 12x12 sheet of Floral Muse paper in the centre so that you are left with a border. Cut a 16.5cmx12cm rectangle from the 8x8 Floral Muse pack and distress the edges. Matt your 6x4 photo in the centre, to give yourself a border. Glue a length of Floral Muse lace to the left of your photo and adhere your finished layered photo to the centre of your scrapbook. 10.Create the title using the First Edition Foil Applicator. First, print your sentiment using your laser printer, in black laser ink onto an A4 sheet of First Edition Ultra Smooth card ready to foil. Make sure the printer is set to the maximum ink coverage setting. 11. Pick your First Edition foil to cover the design. Layer the foil on top of the design, silver side facing down and cover with a piece of plain white A4 paper so you cannot see any foil. Switch on your First Edition Foil Applicator and wait until the green light is on. Carefully pass the design through the machine and once it has come through, carefully peel off the foil. Cut around the wording and add this to the top of your scrapbook layout using 3D foam pads, in the centre. 12.It’s time to add embellishments! Cut a Floral Muse wooden frame in half and glue one half to the bottom right of your image and one half along the left edge, at the bottom. Using the First Edition Layered flower dies, die cut two large and two smaller flowers and layer the smaller flowers to the larger flowers. Add foil glue to the edge of the petals and carefully rub a small sheet of gold foil on top (silver side facing down) and add a Floral Muse adhesive pearl to the centre of each flower. 13. Stamp a few butterfly designs onto white card using the Floral Muse butterfly clear stamp. Once dry, cut out and colour in to add interest. Glue one on top of your green doily and the other to the bottom right of the layered Floral Muse sheets. 14. Die cut a butterfly from the First Edition Butterflies set and a flower from the First Edition Layered Flowers set onto First Edition foam. Choose two different coloured sheets of First Edition foil, and rub them on top of the foam, silver side facing down. Peel back and glue your flower to the top right of your photo and the butterfly to the left of your photo. 15. Add a few other embellishments to your layout such as the Floral Muse paper flowers and accordion heart sticker. The Floral Muse collection is so varied with its beautiful selection of embellishments, a perfect collection for decorating and making your scrapbook layouts. We love Katie’s collage effect, how will you decorate your scrapbook layout? 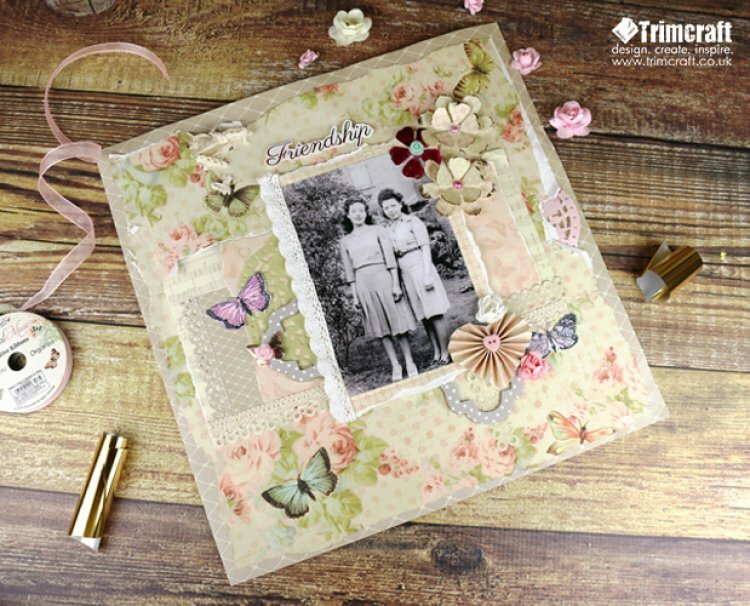 Don’t forget to upload your fantastic layouts to the project gallery and #Trimcraft when posting on social media!